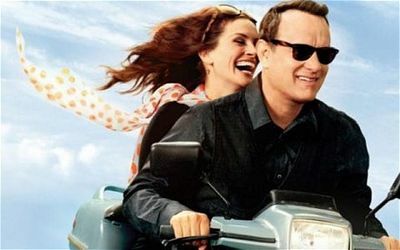 According to The Telegraph, a Spanish government agency has fined the makers of the film "Larry Crowne" £25,000 (which might actually be more than it took in at the box office) for a movie poster that shows Julia Roberts and Tom Hanks riding on a scooter without protective headgear. This image is rated P for "Peligroso"
Spanish law bans any "publicity" that "may incite excessive speed, reckless driving, situations of danger or any other circumstance involving conduct contrary to the principles of the law." That must make for some pretty damn boring movie posters, if this one was deemed so dangerous that it might incite reckless behavior. It's Tom Hanks and Julia Roberts on a scooter in a romantic comedy, for God's sake. The studio in question, Tripictures, said it originally thought the fine was a joke. It pointed out that the actors in the movie itself all wore helmets when riding scooters, which does not make the movie sound any more interesting, to be honest, but the poster itself was apparently considered dangerous enough to trigger a fine. This is of course the same country that is known for letting people run down narrow streets pursued by angry bulls. Helmetless people. The report says that Shakira was fined last year pursuant to the same law for failing to wear a helmet in a music video. Good idea, Spain — have a law that forces Shakira to wear more clothing.